The monastery’s collection of seven Asian-style buildings seems out of place in this New York suburb, but lovely nonetheless. We followed the stone path lined with statues of Buddha’s chubby, bald disciples up to the Great Buddha Hall. This took some time, as The Boy wanted to get a better look as several of them, which were positioned at eye level. Each had an open outstretched palm or other nooks in which to leave coins and small gifts. We reached the hall, and removed our shoes. We entered, looked up, and gaped. 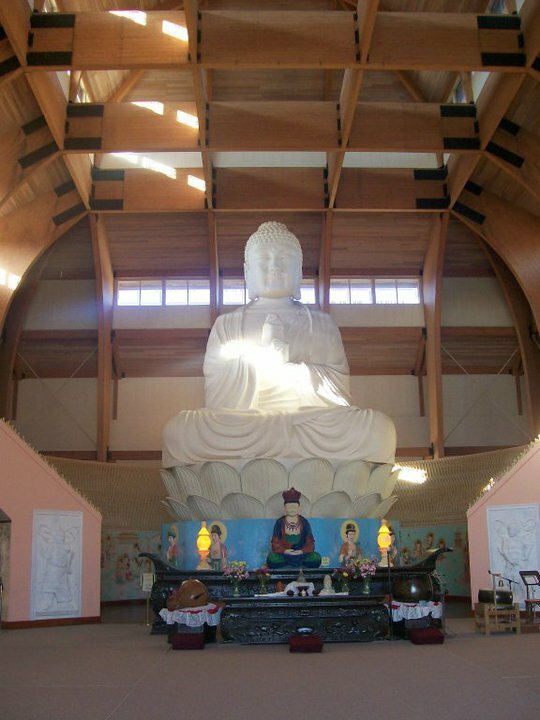 At 37-feet tall, the “Great Buddha Vairocana” sits serenely in lotus pose, commanding the silent respect of the 10,000 small Buddha statues encircling him. Filled with the brilliant light of a late fall day, the spacious hall provided an unobstructed, pillar-free view — an architectural homage to the Tang Dynasty. We two sat in a space designed for 2,000. The hall was empty, except for a lone employee, polishing the dark lacquered wood of a side altar. I was proud of The Boy’s respectful conduct. Looking all around at the murals, altars, and up at Buddha himself, he stared in calm reverence. Later he told me he felt all his worries float away in that space. I’m not sure how much an eight-year old has to worry about, but I’m glad Buddha was able to help. We availed ourselves of the free literature in the back of the room, leaving a small donation. The Boy was thrilled with his colorful Chinese bookmarks, and even took a small book about Buddhism so he could learn more about it. The Great Buddha Vairocana. And by great, we mean 37-feet tall. 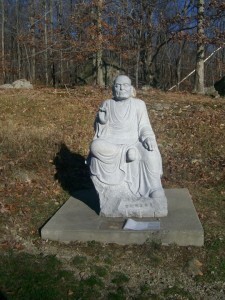 The monastery is run by monks belonging to the Buddhist Association of the United States (BAUS). 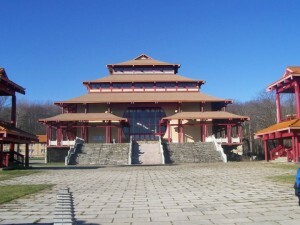 Retreats and workshops are offered to the general public, as well as an inexpensive, communal vegetarian meal on weekends. This site is a solid 7. 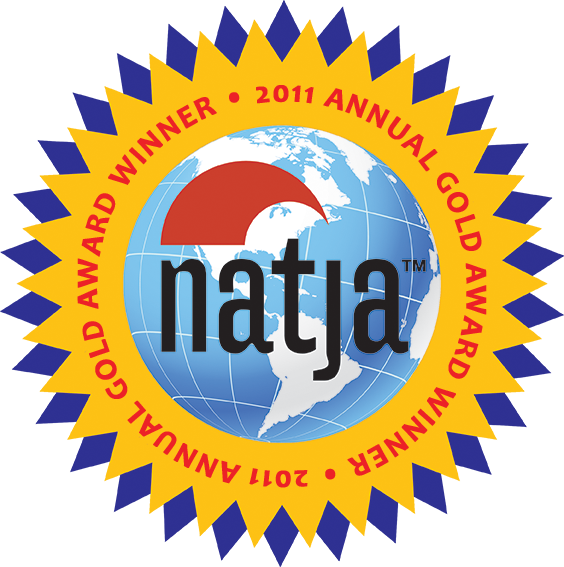 Going there offers an amazing opportunity to expose children to a different culture, religion and philosophy, and to get a conversation started about the Buddhist principles of wisdom, ethical conduct and mental discipline. So, just where is the world’s largest Buddha? That depends. The Leshan Giant Buddha in China, at 233 feet tall is the largest carved stone Buddha, and is seated. The Monywa Buddha of Burma reclines, and stretches to 294 feet. And the bronze Ushiku Buddha of Japan stands at 394 feet. Epilogue: After a visit with the large-bellied one, you can head west into the riverside village of Cold Spring for lunch or dinner. You may be tempted by the antiques and gift shops, but chances are, your kids won’t. Take them to Whistling Willies’ American Grill for American comfort food, the Silver Spoon Restaurant for their popular “Big Daddy Burger,” or to the Cold Spring Depot if you’d like to eat outdoors and watch trains speed by. 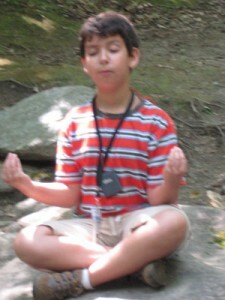 The Boy’s best Buddha impression. The Mom’s worst photographer impression. Oooh, something to add to my New York map (I’ve had a route that passes very near the monastery mapped-out for a few months – just haven’t had enough free time in a row to do it yet lol). This looks beautiful and has “big stuff” to boot! I’m always curious as to whether photography is okay in this type of setting … but there seem to be quite a few images of the buddha online; so I assume it wasn’t frowned upon? My son and I visited a few summers ago. He loved the 7 jewels lake. I loved the peacefulness of it. Looks like I need to take some relaxation and focusing training from your son. He seems so centered after his visit to the Buddha.